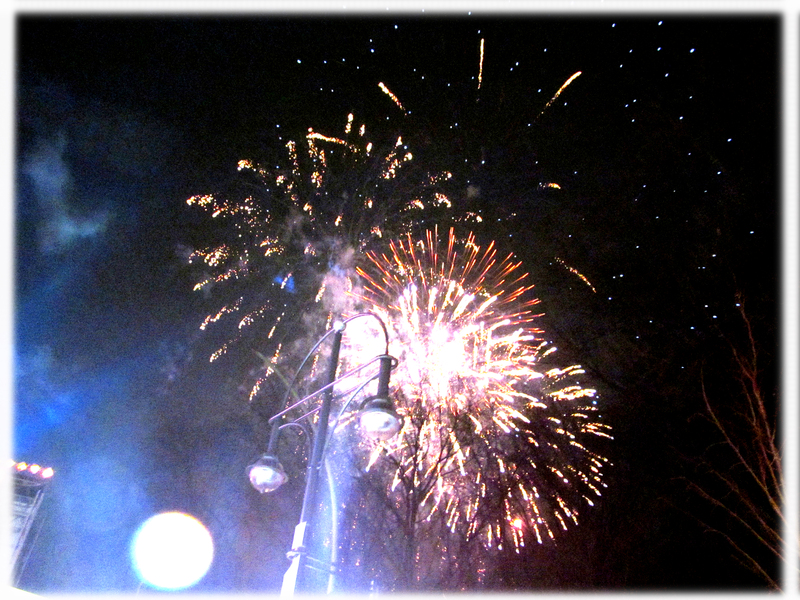 New Year’s Eve 2012 began with a pelting of firecrackers; such is the pastime of revelling Berlin children bound by no man’s rules. 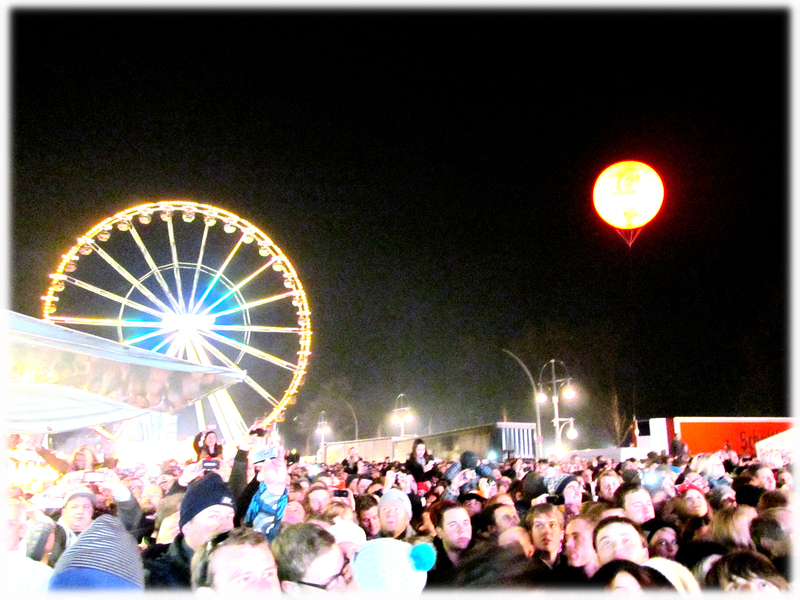 Fearing for our facial features (and as concerned as a Australian farmer in a drought about fire safety) we headed out into the wild streets on December 31st heading towards the notorious festivities at the Brandenburg Gate. It was evident no fireworks rules were in place and the streets were a Buzz, Crackle and Pop! Of activity. Older partiers fired blanks from real guns and, on occasion, we experienced a few moments of blindness from particularly bright explosions, mewing helplessly for each other in the madness like blind kittens. The promenade to the Gate was packed with people, more people in fact than there are in the whole of New Zealand. Fair games and Gluwein (mulled wine) stands entertained the throngs pushing their way towards the main stage. Beer ran out quickly (not surprising given a single women managed to spill six pints on me simultaneously) and we switched to mulled wine, burning our hands in the process. As the New Year rang in, with a song we couldn’t understand, fireworks blazed overhead and the guy with the gun let off a few more blanks. Carried by the sea of Berliners we made our way to one of the city’s notorious party districts alongside the infamous “RAW” squat clubs. Here we (and by that I mean I) managed to break the door of a bar’s restaurant, have a minor panic attack that I would be locked in the underground concrete bathroom of a foreign night club, before being rescued by a unimpressed German bouncer. All in all, a good night. The next day the streets looked worse than London looked after the riots. Firecracker remains had gone soggy in the rain and formed messy maroon puddles of sludge all over Berlin. There was little distinction between said puddles and the dog poop and vomit that mingled alongside it so we avoided all three was great caution. We found ourselves back in the party district (barely recognisable in the daylight) again for an all you can eat German brunch surrounded by the last-man-standing New Year partygoers, still up at 3pm from the night before. Waving goodbye to our hangovers the 2nd proved a more productive day as we braved the rain for another “Free” walking tour aptly named The Alternative Tour. 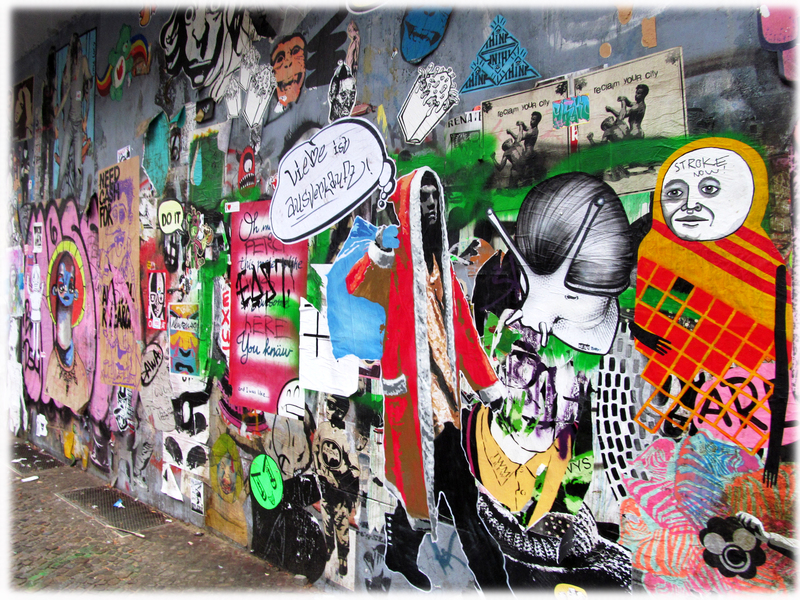 Alongside our staunchly anti gentry guide we visited street art hot spots (our third visit to RAW) a tree house, and a multi storied squat/gallery filled with a warring community of artists on the verge of eviction. All of this has become “gentrified” according to our guide, who, although pleasant, harboured a misguided resentment against frozen yoghurt as the symbol of all things evil and commercial. This, from a woman who arranged to meet her tours at Starbucks. From alternative Berlin we headed to popular Berlin, the Fassbender and Rausch chocolate shop famed for it’s intricate chocolate sculptures depicting Berlin’s top tourist attractions. We steered away from ordering steaks with chocolate sauce, or any of the other unusual dishes on the attached restaurant’s menu, and instead chose mouth watering traditional desserts. We finished the evening at a toilet themed bar drinking cocktails from bed pans and chamber pots. Having seen token panels here and there around the city we made our last day in Berlin all about seeing THE wall. We started with the historical section, surrounded by memorials and eerily quiet on a chilly winter’s morning. The stories of families torn apart is harrowing, the stories of those who climbed or tunnelled under the wall even more so. It was a stark change of scene that afternoon when we headed to the East Side Gallery, the stretch of wall covered in memorial murals. 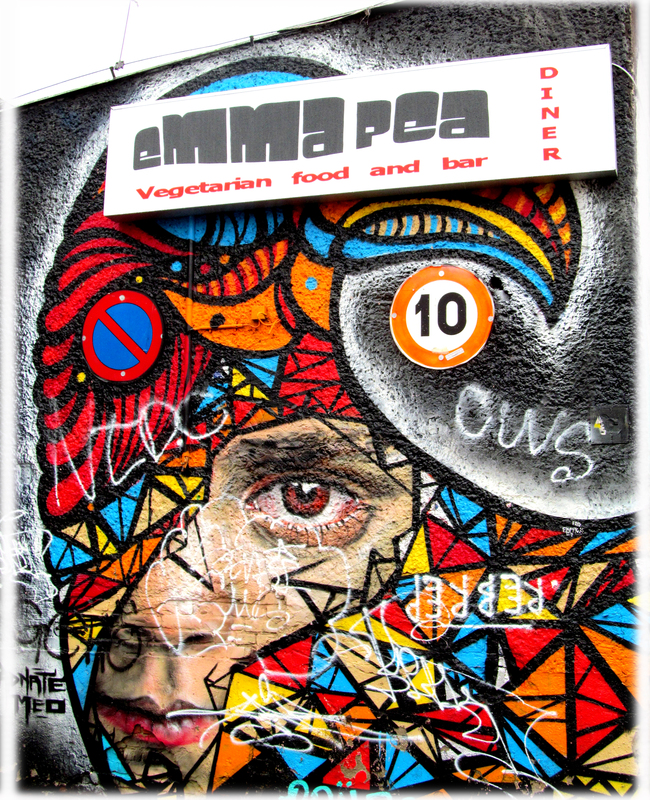 After seeing the contemporary street art of Berlin on our Alternative Tour the East Side Gallery proved to me something of a disappointment, many of the murals screamed of the late 80’s and 90’s bringing back memories of the gaudy motifs of my childhood. With the 80’s and 90’s on my mind we headed to one of the city’s various vintage outlets for 5 Levels of Thrift, but I wasn’t feeling the nostalgic vibes that day and left empty handed. I ended my week in Berlin the next day in solitary and on a sombre note, visiting The Topography of Terror Museum . Built bunker style under a mammoth Holocaust memorial, this museum is modern, interactive and highly recommendable. But unfortunately I had a plane to catch and left the museum to make sure, in true Amanda style, that I was 4 hours early for my flight at a tiny airport with one cafe. Auf Wiedersehn!